This entry was posted in Magazines, Publishing, Short Stories and tagged autumn, Hadrosaur Productions, Hadrosaur Tales, hiatus, mad science, poetry, short stories, tales of the talisman. The King Arthur’s grave tale really interests me, as my mom’s family originated from the part of England believed the legendary Camelot. I will try to remember to check the site. Will you publish a reminder when it comes out? Thanks for the info, Dave. 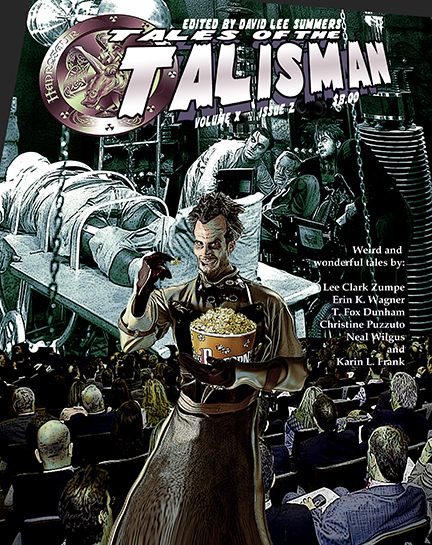 I have been proud to be a contributor to both Hadrosaur Tales and Tales of the Talisman. You’re welcome, Bryan. It’s been great working with you in Tales and I look forward to your upcoming reviews. Among the back burner projects I allude to, is to revisit the poems we collaborated on and get them back on the circuit and see if I can find homes for them. I have a few other collaborative projects I want to work on with others as well. I’ll have those reviews to you in about two weeks time. Finishing up the semester, so I’ll have plenty of time to breathe after Wednesday. I love the title – Tales of the Talisman – just rhymes on the tongue, doesn’t it? Thanks! The name came to me when I was riding home from on the train from a writer’s conference in West Virginia. Thank you. I’m proud of the stories and poems we’ve published over the years. Another way to look at my goal is that I want to get these stories and poems into the hands of more readers and hope I can determine a good way to do that. Hi David. I just ordered your ebook at Amazon. The book is listed like this: The Dragon’s Quest (Dragon’s Fall Book 2) If this is a two part book, where do I order part one? So, if Desmond’s story grabs you and you want more, I’d be inclined to steer you to the full ebook, rather than simply going to part 1. Awesome and thanks again! Yeah, shopping and decorating are on my to do list this week!